1. GET A QUOTE: Send us approximate measurements of your window through our Quote Form or email directly at albert@bettertex.com – we usually answer the same day! A picture of the window area would also help! 2. SELECT FABRIC: Select a fabric or bring in your own fabric (COM). We also have on-contract designers to help you customize the perfect drapery style for your project. 3. SCHEDULE A MEASURING/INSTALLATION: We will come to take precise measurements for your window treatments and start fabrication of your made-to-order drapery, shades or blinds. Once fabrication is completed, we will set up a white-glove delivery and installation of your new window treatments! 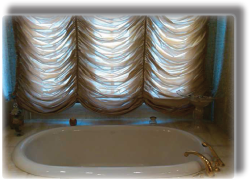 The affect a custom Drapery or any other custom window treatment can do to beautify a room are exponential. Beginning with a client’s photograph, a drawing, or even a thought; our experienced contractors and design team will expertly analyze, advise, and finally manufacture your custom window treatment design project - from draperies, to fully customizable shades or blinds - into perfection. Bettertex has been performing Contract Drapery work for over 20 years. We have been contracted by a wide variety of businesses and individuals, and provided Contract work for an array of residential and commercial applications, ranging from film, theater and event venues to retail stores and restaurants, hotels and lounges. Store planners, architects, and other professionals have consistently contracted Bettertex for custom drapery, shades and other window treatments as part of their interior design projects. For photos of our contract work, please visit our Gallery. Contract, Custom Draperies can come in all types of style and designs. The selection can start at wide range of traditional and contemporary styles to modern draperies highlighted in some of the top design magazines of today. At our Manhattan showroom, our design team can guide you to make the right choice of drapery for the room you’re decorating. From to pinch pleat, to grommet, to ripple fold, to rod pocket we are more than happy to discuss your drapery project from A to Z. Our design team also offers a top quality selection of hardware to match your drapery design. At the Bettertex Interiors workshop quality is of the utmost importance, which is why all draperies are done by our quality craft persons contracted by us to achieve the highest standard. To ensure quality, our custom draperies are examined for quality before installation. Fortunately, the Bettertex Interiors workshop has been the trusted custom drapery source for some of the top contract designers and architects in NYC for over 20 years. Much of our contract drapery work is featured in Hotels, Magazines, Showrooms, Retail Boutiques, and residential apartments across New York City. To complete our full service care, we provide full installation on all products we offer. Start your custom draperies project today! Get started by submitting a Free Custom Drapery Estimate Request, or visiting our Yardage Chart for more information about the different types of draperies, shades, curtains, and other window treatments, as well as how to estimate the required yardage for your own windows.